The term “pole barn” is sometimes misused, causing confusion when trying to find the right product. People who ask about a pole barn may actually be envisioning a steel building and simply using an incorrect term. To determine which structure will better fit your needs, let’s take a look at the differences between pole barns and RHINO metal buildings. A pole barn uses wood beams or “poles” buried in the ground as the main support structure for the outer walls and roof trusses. Features that are common to most pole barns include all wood poles as the support beams and a metal shell for the outer walls. Sometimes a concrete foundation is added, but many will have a simple dirt floor. What is a RHINO metal building? RHINO steel buildings differ from pole barns in that the structure is made entirely of prefabricated steel components, right down to the support beams. A steel frame won’t rot and deteriorate. Wood will. Our metal buildings are termite-resistant and mold resistant. Wood isn’t. RHINO metal buildings can span 200’ or more without needing interior load-bearing columns or walls. Clearspan options are extremely limited with a pole barn. A properly-grounded steel building is less likely to be damaged by lightning than a wood structure. Prefabricated steel buildings are connected with high-strength bolts and screws that hold tight, keeping the building straight and strong. Wood structures are connected with nails and staples that loosen and pull out over time as wood contracts and expands with its ever-changing moisture content, causing the framing to shift, warp, sag, and creep. This can also cause water leaks, damaging items in the building. Steel buildings are practically maintenance free; wood pole barns are maintenance intensive. The wooden poles are buried deep in the ground, which means they will shift and eventually decay. As the foundation poles shift, a pole barn may have to be straightened every five to seven years, a process which can cost several thousand dollars. Steel is noncombustible and cannot add fuel to a fire. Wood framing is easily ignited and certainly adds fuel to a structural fire. Steel is the most recycled material on the planet. It can be recycled over and over without losing any of its inherent properties. RHINO’s buildings contain an average of 89.5% recycled content. Chemically-treated wood often cannot be recycled and can leach dangerous chemicals into the ground when dumped into landfills. Copper sulfate pressure treated wood is considered unsafe for livestock. Steel members are manufactured to be straight, uniform, and consistent. Wood poles and beams are inconsistent, with each framing piece varying in strength, quality, and performance when built— and changing constantly with moisture and soil variation after the building is completed. 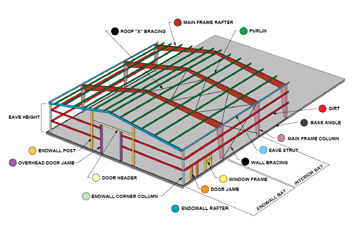 RHINO’s prefabricated building kits have all parts marked for easy identification and framing erection. The RHINO kit arrives at the job site ready to assemble. In most pole barn packages, however, pieces are not sorted or marked, causing confusion and delays. RHINO buildings come complete with three sets of engineer-stamped plans and a Letter of Certification, which makes obtaining building permits quick and easy. Pole barns may come without professional plans or documentation and permitting is often difficult, and impossible in some locales. Steel buildings often enjoy insurance savings over wood structures, sometimes as much as 30% or more. RHINO wall and roof panels are 26-gauge steel. Most pole barns use 29-gauge sheeting, which is about 30% lighter by weight. The corrugation pattern on RHINO’s steel panels is 1-1/4” deep, compared to the 5/8” deep corrugation typical on pole barn sheathing. The deeper the corrugation, the stronger the panel. In addition, attaching metal panels to the wood poles increases the likelihood of rust, so sheeting may have to be periodically replaced. A pole barn is not considered a permanent structure. At best, they may last 15-20 years with expensive maintenance. A RHINO steel building will last decades longer than a pole barn. Our framing is guaranteed to meet or exceed all local building codes for the lifetime of the structure. A steel building increases the value of your property, and retains its structural integrity and value for decades. A pole barn is not usually even considered a property asset. Pole barns have truss-type rafters which not only take up building space, but create a perfect place for birds to roost and nest, spreading their droppings over your building’s contents— and depositing the possibility of Avian flu. RHINO’s premium steel buildings are clearly a better value than pole barns. Share the post "Pole Barns vs. Rhino Steel Buildings"